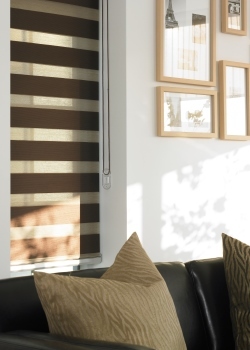 Cleverly designed Zebra blind provides high levels of light and privacy control in a single blind. 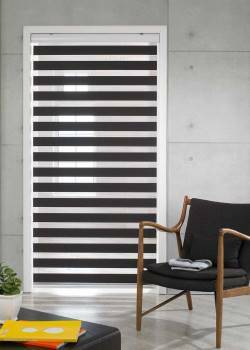 The cleverly designed Zebra Blind utilses a horizontal striped fabric with alternating Translucent or Block Out and Sheer stripes to create a Day and Night blind in one product. The two layers of this fabric move independantly to create overlaping combinations. A simple but effective idea that allows high levels of light and privacy control with the one product. The Block Out stripe is actually Block Out but please understand that some light will creep in between the stripes hence you should consider more as a Dim Out. We understand that it's hard to tell the difference in the fabrics just by looking at the pictures. 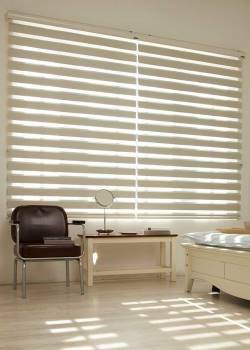 Order a free sample to truly confirm the colour and texture.The Translucent range of fabrics will allow filtered light even when in the Privacy position. 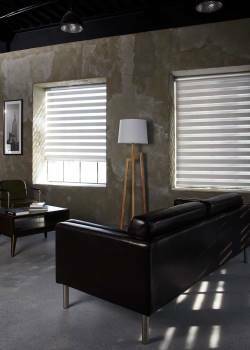 The Block Out range of fabrics will darken a room when in the privacy position and therefore more suitable for Bedrooms. Complete with Headbox. Select your choice of Headbox colour and the Baserail and Cord colours will co-ordinate.